What is Snoozer Luxury Pet Sofa? The Snoozer Luxury Pet Sofa gives your pet his or her own private sofa, so you don't have to worry about pet hair and dander on yours! It's shaped just like a small sofa and perfect for most sizes of pets. Snoozer Luxury Pet Sofa is stuffed with high-loft polyester fill and covered in a microsuede fabric that can be removed for easy cleaning. It has bolster armrests so your pet can nestle in-between the sofa and the sides. The Snoozer Luxury Pet Sofa comes in small, large, and Xlarge sizes in either a peat, black, or red color. The Snoozer Luxury Pet Sofa is a luxurious pet sofa, which provides your pet with his or her own private sofa. The exterior is made with a plush, soft microfiber, and the interior is made with 7" of foam and high-loft polyfill for ultimate comfort. The cover is machine washable and dryable, as long as you are using low heat, and easy to take on and off with the addition of a rust-proof zipper. The Luxury Pet Sofa comes in 3 different sizes to meet your pet's needs, (see sizing options on "Size" tab). Snoozer Luxury Pet Sofa gives your pet his or her own private sofa. Great for all pets, even two smaller pets to use. 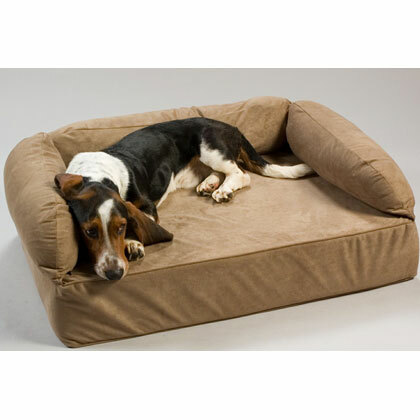 Allow your pet to rest or nest inside the Snoozer Luxury Pet Sofa at anytime. Store in a cool, dry place. Pets that love to sleep with their head on an armrest or pillow love the bolster sides.